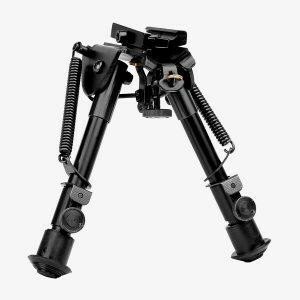 This Compact Bipod (Smooth Legs) is designed for use on firearms with a sling swivel installed to mount it to. The Compact Bipod (Smooth Legs) is perfect for AR15/M16 and many other platforms. The legs are connected to the mount with large springs that allow the user to instantly deploy them. The Compact Bipod (Smooth Legs) is adjustable for height on both legs to compensate for uneven terrain or shooting benches. The Compact Bipod (Smooth Legs) comes equipped with rubber legs caps to prevent slipping on wet or slick surfaces and is 7.8″ overall. Includes panning, extendable/foldable legs, and dual mounts; rubberized stand.